The low-cost entry-level RCDT310 model is suitable for use on supplies between 100 V and 280 V, and offers 0.5I, I and 5I tests, with provision for tests starting at 0° or 180° of the supply waveform, as well as for DC tests. It also has facilities for testing standard and selective RCDs, and covers current ranges from 30mA to 500mA. When connected to a live supply, it defaults to voltmeter mode. The mid-range RCDT320 covers a wider supply voltage range of 50 V to 280 V, allowing use with centre-tapped 110 V supplies. It incorporates ramp testing, for RCD tripping current measurement, and the unique Megger auto sequence test feature, which saves time by allowing the tester to conduct all the RCD tests, and to store the results while the operator stands by the RCD, resetting it as appropriate. 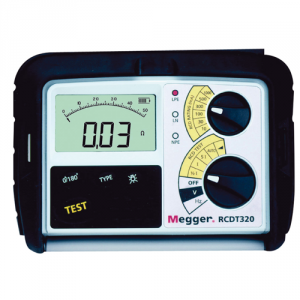 The operating current range of the RCDT320 is extended to cover 10 mA to 1,000 mA devices, and the ability to measure AC supply voltage and frequency is added. The large liquid crystal display for test results is backlit in this model, making it easier to use in locations with low ambient light levels. A memory bar graph acts as a ‘Fuel Gauge’ showing how much memory has been used. Test results are downloaded to CSV (Comma Separated Variable) spreadsheets. All models in the range comply fully with the requirements of IEC61010-1 for Category III 300 V applications, and are supplied complete with appropriate test leads and a calibration certificate.